Hi, I'm Birdie, the spokes chicken for birdieshappyplants.com. I imagine you are wondering what makes a plant happy anyway? (And probably why is a chicken growing plants in the first place, but that is another story. Birdie's plants have been "brought up right", given just the right amount of fertilizer (not too much) and water (not too much) and proper soil (acidic, well drained). Birdie's Happy Plants are not over fertilized plants that grew too fast. No, no, no those would not survive the cold. Your plant thrived through at least four Michigan winters. It is proven hardy and acclimated to our Midwest climate. Yes, yes, yes, a happy plant! It is an easy transition from our nursery to your home, we have a few growing tips to share with you. What to plant: Use hardy varieties (you have that covered)! Go to Our Plants for more ideas. 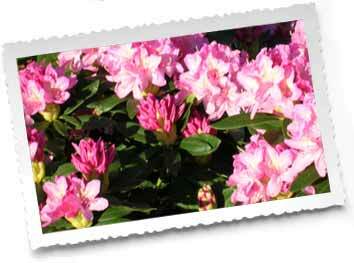 How to plant: Condition the soil properly; Rhododendrons need an acidic, well drained, organic rich soil. Go to Planting & Care Tips for details. Where and Why to plant: Match the variety to its desired location - most hybrids, for example, should be kept from the winter sun. Go to Planting & Care Tips for find out more. We have also included information on fertilizing, trimming and pests. It's as easy as one two three! We know you will enjoy your happy plant for many years to come! Q. What happened to the chicken whose feathers were all pointing the wrong way? A. She was tickled to death! As luck would have it... 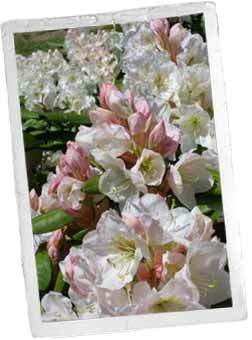 I happened to grow up on a Rhododendron Nursery. My coop was near a field of Rhodies. As a curious chicken and not at all interested in laying eggs, I kept wandering further away from home. Being close to the ground, it was natural that I became interested in the care and cultivation of the beautiful plants. My skills were soon recognized by the proprietor and I was promoted to head grower. Now that we have flown to new heights going cyber with a website and all, who better to represent birdieshappyplants.com than me!